Otoplasty, or ear reduction surgery, is a type of plastic surgery that corrects protruding or prominent ears. Ear surgery to correct protruding ears is also referred to as ear pinning, which permanently sets the ears back closer to the head. Protruding ears (or lop ear deformity) is a common developmental abnormality from birth. It is one that can lead to significant peer ridicule and teasing, especially in children. Otoplasty is the most conventional and effective type of surgery to address this type of ear deformity. Dr. Sanaz Harirchian is a skilled and experienced plastic surgeon who understands the devastating consequences that protruding or overly large ears can have on a patient’s self-esteem and quality of life. Our Houston plastic and reconstructive surgery center is pleased to offer excellence in otoplasty, allowing children and adults to regain attractive, balanced and natural-looking ears despite what they were born with. If you feel embarrassed or bothered by the way your ears protrude from your head or because of their abnormal size or shape, you may be a candidate for otoplasty. Through her dedicated ear reshaping techniques, Dr. Harirchian can help your ears compliment your appearance instead of distract from your natural facial beauty. Otoplasty may also involve reducing the size of the ears. It is typically a minimally invasive procedure where incisions are well hidden behind the ear. Candidates for otoplasty surgery include patients with marcotia, a rare congenital condition causing excessively large ears, as well as those with prominent ear deformity or misshaped ears. Dr. Harirchian will carefully evaluate your specific concerns so that a surgical approach will be tailored to best suit your needs. Generally speaking, ear reduction surgery should be performed sooner rather than later to minimize psychological setbacks due to teasing at school. However, otoplasty must not be performed on patients younger than five, as the ear cartilage needs to reach full growth. It should be known that otoplasty can provide equally successful results in adults should the patient wait. For a surgeon who uses refined technique and creative artistry when reshaping, repositioning or reducing the size of the ears, turn to Dr. Sanaz Harirchian in Houston. 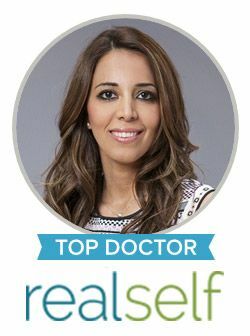 She is an esteemed facial plastic surgeon who is known for integrating innovative techniques to produce the most natural and long-lasting results in otoplasty. For more information on Dr. Harirchian’s otoplasty methods or to determine you or your child’s candidacy for ear reduction surgery, please contact our office today.